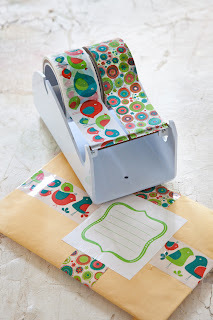 I would love to use tapeswell when I send packages to my nieces & nephews! I've DIY'd pretty packing tape to send presents (most of my family is across the country), but I'd love to greet them with some Tapeswell :) Also, I'd love to use the envelope wraparounds for my wedding invites! I left you a comment on facebook! Happy Birthday! I plan to use TapeSwell to decorate for a reception! I mail a lot of packages home to friends/family and they all get decorated while they get protected! I love this stuff! For my son's birthday party invitations this summer! Perfect! fan on facebook and left a message! I would use tapeswell on my work packages. I use "fancy" tape to mail orders out, just a fun way to add a little something extra to my customers purchases. 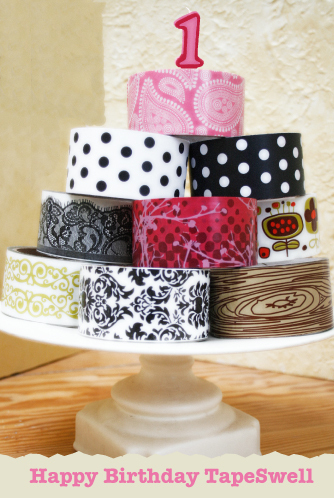 I would love to use your adorable tape! I just became a FAN on FB-and im so happy about it! (Tammy Wall-Brodbeck on FB, also milkandcookeez)I left a comment under Tammy. I use my Tapeswell on scrapbook layouts and cards. So yummy! Journals and scrapbook pages. I also like to use tape on picture frames, the actual glass portion to draw your eye to the part of the image you want showcased. Wow, I didn't know how many beautiful new tapes that you had. I love the pink one. I would definately use it for gift packages sent in the mail to my friends. I use your tape in my art journals ... to wrap gifts ... mail packages ... to add some beauty to my life, lol. I use Tapeswell in art journals and to decorate envelopes. I use tape swell on all of my packages that I ship to my customers. Its a nice touch, the mail man has noticed. oh, and my girls talk a lot- it is like a "mouth accessory" to keep it closed. 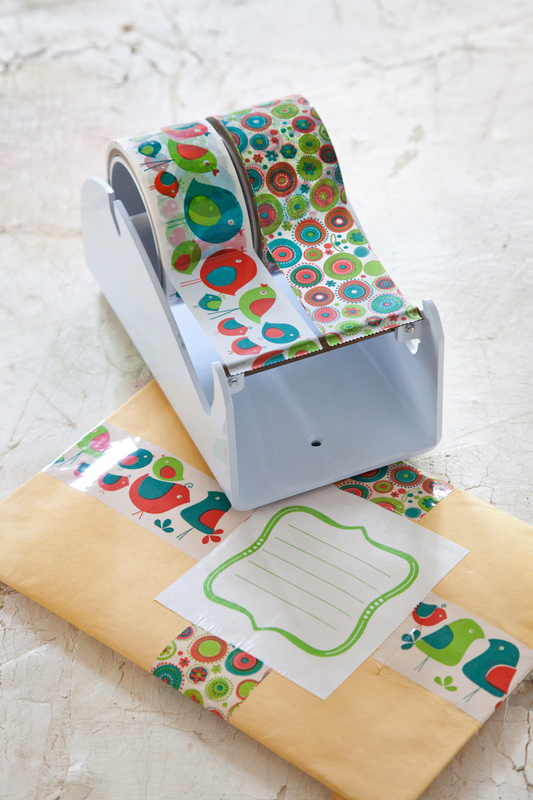 Wow - I've never seen your tape before, but in addition to decorating pretty-mail, I'd use it on scrapbook pages and whenever I could manage to sneak it onto something! It's adorable! I use them in the classroom as frames, borders, on booklets. I'd use it on all my packages I mail out, as well as letters to friends. I'd also use it in my scrapbooks and journals or to wrap presents with. So many uses, everyday! I have used the tape on all kinds of crafts (scrapbooking, creating stationary, wrapping presents, and accents for mattes on my photo frames), and of course, packages and treats I like to send out to my friends. They have come to expect a great looking package, and the Tape Swell products really help with that. I use tapeswell to wrap bubble tubes for wedding clients-adds a unique, color-coordinated touch, and looks beautiful! I've used it mostly to decorate my packages. I would use it in my art journal pages and to add a little oomph to packages. Besides using tapeswell to send packages to my long-distance friends, I would use it in my scrapbooks. Congratulations on the first year! Best wishes for the second to be even better. I just loaded up my dispenser with my favorite "spring" tapes! Happy 1st year! I love using TapeSwell to decorate packages! Please keep the designs coming! I buy it for family and friends and end up keeping it for myself! I am just starting up a jewelry business and have been looking for a great way to dress up our mailings. Now we have found it! What a wonderful idea and I need to give a shout out of thanks to HUMANWEAR for introducing me to your product because I saw you on their website. I LOVE the wrap around labels and the tape!! Oh gosh I just love everything. We will be placing an order very soon! The Polka dot tape adds a lot of flair to packages. My mom loves to get a box from me she is in North Carolina and I am in Arizona. I also like to put an edge of dots on my bills. There's no way they can lose that one. I would use the tape to spruce up my packages! Such a fun idea! I just recently discovered Tapeswell, and LOVE IT! I'm getting married in August, and plan on using Tapeswell for all of my DIY needs. We're doing a rustic theme in a log cabin, so I wanted something elegant to help tie everything together. -Use matching tape to decorate place settings, and as a wrap-around on plastic cups to give them a little more class! I'm SO glad that I found Tapeswell! and anything else creative I can think of. This is the first I have seen your product, but I love it! I sell books through amazon and it would be fun to use this tape to pretty up my packaging. I would use TapeSwell in my art journal as a decorative element.